YOUNGSTOWN, Ohio – The DOYO Live digital marketing and interactive design conference keeps getting bigger, and is giving regional marketers direct access to some of the top names in the industry. Allen Gannett, founder and CEO of the Washington, D.C.,-based TrackMaven and author of “The Creative Curve,” provided Thursday morning’s keynote address. His marketing analytics software company boasts such customers as Amtrak, U.S. Bank, Saks Fifth Avenue and The Home Depot. 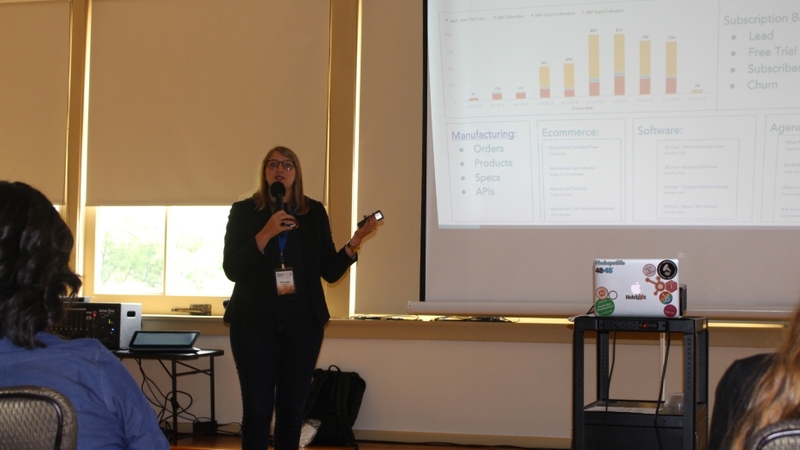 Representatives from well-known firms such as SEMrush, a global online marketing tool, and HubSpot, a Massachusetts-based provider of marketing and sales software, led two of the event’s 12 breakout sessions. SEMrush boasts more than 400 employees in four countries. And on Wednesday, HubSpot announced its Q2 results with $122.6 million in total revenue, up 38% from the same period last year. Influencers from across the country are taking notice to DOYO for two reasons, Schiraldi explains. First and foremost is the content, he said, as he works to provide “very deep, rich, meaningful content” that teaches attendees something that they can implement into their business the next day. Second, he cites the regional talent that has helped DOYO gain popularity and participation over the last three years. Attendance this year was at 301, up from 270 last year. Talent from the area has also been invited to present at larger events, such as Content Marketing World in Cleveland and HubSpot Inbound in Boston. Topics ranged from branding to digital marketing and social media. This was Rachael Manuel’s first DOYO event. As finance and technology administrator for the city of Hermitage, she hoped to learn more about how to engage city residents with information on events, announcements, public works projects and local business or charity events, she said. Rick Stockburger was looking to social media breakouts to discover ways to assist manufacturers in Warren. Stockburger, vice president and chief operating officer of the Tech Belt Energy Innovation Center, or TBEIC, said understanding social media can help manufacturers move their business forward. Jeff Leo Herrmann, president of Madison, Michigan and Market, Youngstown, said that business using social media should “solve problems and not pitch products.” Herrmann led a breakout session on using video on LinkedIn to increased business. Dhariana Lozano, co-founder of Supremacy Marketing in New York City, led a breakout session on “Algorithm-proof Social Media Strategies for B2B and B2C Brands.” Lozano had been in contact with Schiraldi after he read her blog content online, she said. Schiraldi with Dhariana Lozano, co-founder of New York-based Supremacy Marketing. Lozano established her company three years ago. While working in larger agencies, she saw social media treated like an afterthought rather than an initial part of the overall strategy, she said. Since branching out, her company daily manages 13 clients and offers consultation for others. While New York has many conferences like DOYO, they can be expensive, she said. DOYO serves the small-business community, which makes up many of her customers, she said. “It’s just great to see someone serving that community and bringing knowledge and an event like this to a small town. I think it’s great and I wanted to be a part of it,” she said. Maggie Bomze said she was a little surprised when she learned she would be presenting for HubSpot at the event. Her job as a customer success manager for the company forced her to relocate to Boston from her home in Massillon. She understands that not everybody from northeastern Ohio can make the trip to Boston for HubSpot’s Inbound 2018 conference in September, which is expected to draw around 24,000 attendees. This gives companies like HubSpot an opportunity to connect with those audiences. Maggie Bomze, HubSpot customer success manager, discussed the value of using a CRM like HubSpot to funnel leads to a company’s sales team and close deals. As for the trip to Youngstown itself, she said it’s been pleasant. “It’s a great town. I’m staying in the new hotel and had some great food last night. So it’s been a good stay so far,” she said. There’s also the price point to consider, Schiraldi said. Events like Inbound and Content Marketing World can cost thousands when you factor in entry fees, travel expenses and out of work expenses. A $225 single-day ticket to DOYO is more cost-effective for businesses, he said. “We have a rich, deep talent bench here at this conference for a price point that’s significantly less,” he said. “And a lot of the people who are speaking here are speaking at those conferences. Sable Beshara-Kyle, digital channel manager at The Cafaro Co., said she attended the Social Shake-up conference in Atlanta, but could only send one person because of the cost and the distance. Cafaro Co. sent eight team members to DOYO. “The ability to have our whole marketing team here, whether they work in it on a daily basis, and giving everyone in marketing a familiarity with all these digital tactics, it’s instrumental for the way things are moving,” she said. Last year, Beshara-Kyle attended DOYO and took away the importance of producing video content. As a result, the company hired two multimedia specialists and is producing more in-house creative videos. The videos have helped improve the company’s social engagement, she said. “We were doing great with increasing our followers as is. But now we have that high follower count and we’re able to engage more with those followers and more people are able to see our content,” she said. In addition to education, DOYO gives attendees multiple networking opportunities throughout the day. The networking is what makes events like DOYO crucial to the region’s market, said Joe Jorgenson, president of RobinTek, a website design and digital marketing agency in Columbus. The event improves the region as well, said Sherris Moreira, executive director of the Shenango Valley Chamber of Commerce. As the number of entrepreneurs in the Shenango Valley increase, driven by entities like the eCenter@LindenPointe, Moreira said she’s looking for ways to promote those businesses. She’s working closely with DOYO’s Schiraldi to bring a similar event to her area next spring. Youngstown Mayor Jamael Tito Brown said he met people from outside of the area who were either attending or set up as vendors. DOYO provides regional connections for the city by attracting people who wouldn’t normally think to come to Youngstown for technology, he said, and he hopes to get the city more involved in the event. Founder and lead brand strategist for The Prodigal Co. in Boardman, Jeff Hedrich, will moderate a branding panel at this year’s Ohio Marketing Summit in Cleveland on Aug. 21. Having the chance to speak at a local event “is fantastic,” he said. Hedrich led a breakout session on “fuel-injected brand messaging,” where he stressed the importance of using analytics to strategically craft and deliver a company’s message. Pictured above: DOYO Live founder, Dennis Schiraldi, offers opening remarks at the third annual event.